← Veggiestan: One Month To Go…. OK – I’m not going to give you a pot history of the Middle East. I did contemplate it, admittedly, but just the thought of it sent me running into a dark room to lie down. There’s far too much of it…and Veggiestan is a cookery book. But I did feel that a round-up of who was who and who was when would be helpful, thus distinguishing our Ottoman empires from our Ottoman pouffes, and establishing that there is a bit more to Persia than cats and carpets. It all started around 7,000 years ago, in Lower Mesopotamia (Mesopotamia being the geographical area that falls between the Tigris and the Euphrates in what is now Eastern Iraq). By ‘it’ I mean civilisation, not the actual Creation/emergence from primordial gloop (delete as applicable) you understand. The Sumerians bear the honour of founding the first ever civilisation any which way you cast your parameters: they were the first to develop an agrarian society, and the first to create a written alphabet. They worshipped a range of city gods, and invented the ziggurat for that purpose; they established much of the mythology of the region together with the Mesopotamian pantheon that was worshipped by the empires that followed immediately on from Sumer. Gilgamesh was a Sumerian. Next up are the Akkadians, who seemed quite happy to exist alongside the Sumerians in Mesopotamia for a while before asserting their supremacy under the leadership of a dude called Sargon. The Akkadians did us all a favour in many ways, as their language is far more user-friendly than Sumerian, and archaeologists have thus been able to track a lot of what they got up to. The Akkadians also invented the post office, but we won’t hold it against them. The next culture of note, chronologically speaking, give or take a century, is the New Egyptian Empire. Egyptian civilisation started in about 3000BC, but came to its peak during the eighteenth-twentieth dynasties of rulers (that’s about 1,600BC to you). This was when you got all the hotshot pharaohs, and when their empire was at its largest and most impressive. I hardly need tell you anything about the ancient Egyptians, so we’ll move swiftly on to their contemporaries in the Levant, the Hittites. These guys occupied much of Anatolia (roughly corresponding to modern Turkey) and bits of what we now call Syria and Lebanon. They were relatively peaceful (mean, what’s a little pillaging between neighbouring states? ), and made big strides in the fields of metal-working and constitutional law. They hung around in the ancient world picture of things until around 1180BC when their capital Hattusa was razed to the ground. Next on our imperial tour are the Assyrians. These guys were warlords (remember Byron’s Assyrian ‘coming down like a wolf on the fold’? ), and hung out in Upper Mesopotamia for a number of centuries. They were named after Ashur, who was Noah’s grandson (and who remained a patron god of his eponymous city long after his death). Most fascinating is the fact that they are one of the few ancient empires to survive, albeit in a less belligerent guise: there are still millions of Assyrians in the world today, although many have fled their ‘native’ Iraq, and they still speak Aramaic Assyrian. Awesome, no? And on to Babylon. We all know that they had some hanging gardens, and a mighty tower. Some of us are married to sci-fi fans and know that ancient Babylonians somehow ended up in outer space. But what of the real Babylonia? The city was founded by a chap called Hamurabi in about 1750BC. So yes, the Babylonians were contemporaries of the Akkadians and the Assyrians. But they only became an empire of sorts in the 7th century BC when the Assyrians began to lose the plot. During their long history they did wonders for maths, astronomy, and philosophy. Leaving the way for the rise of the Macedonian Empire. As empires go, the rise of the Macedonians in Northern Greece was meteoric. King Phillip had already started to consolidate the military and bully the neighbours – and then his son Alexander took the army for a long walk. In just fifteen or so years he had taken over most of the Middle East, but his early demise and the subsequent in-fighting of his successors left an imperial vacuum. This was filled to the West by the Romans (but you know all about them so the less said the better), to the South (Egypt) by Ptolemy and to the East by the Seleucids (named after Seleucus, a former Macedonian general) and the Parthians (who were, strictly speaking, part of the Seleucid empire). The Parthians ended up ruling much of North Eastern Iran (with a few chunks of Central Asia added on), whilst the Seleucids governed from Syria. Don’t worry – we’re over halfway there. Time for the Second Persian Empire: the Sassanids. These chaps took over from the Parthians in the third century AD, but were a bit more ambitious and were soon competing with the fading Roman empire for land. They ruled Persia, the Levant, Central Asia and parts of the Arabian peninsula for around four hundred years, during which time arts and crafts, trade and science all flourished. At the same time the Byzantine Empire was growing in strength and influence in (what we now call) Greece and Turkey, based round the city of Byzantium (aka Constantinople, aka Istanbul), and the emphasis there was equally cerebral (that is not to say that they were entirely peaceable). The Byzantine Empire was impressive in its longevity: it lasted over a thousand years, until around 1300 AD when the Ottomans took over. Of which more presently. The next empire of note is that of the Caliphate: the military and political machine behind Islam. After the death of the Prophet Mohammad in 632AD most of Veggiestan came to be ruled by his successors. There were arguments over exactly who these should be, a schism which saw Sunnis and Shi’ites go off in slightly different directions (see below). The Caliphate governed initially from Medina and Mecca, and their influence, under different dynasties, lasted an astonishing thirteen hundred years – it was only abolished in 1924 by Atatürk, and indeed there are still calls for it to be re-established as the governing body of the Islamic world. Special mention in dispatches here for Saladin, who developed his own mini-empire within the Caliphate after his heroism during the Crusades. Another special mention is needed for the Seljuks, a Turkic people who arrived from the steppes to the North East in the mid-tenth century AD, converted to Islam and kind of took over. Their empire extended as far as the Mediterranean, but their chief influence was over Iran, where literature and science flourished. Think Omar Khayyam and Avicenna. They hung around until the twelfth century when a chap called Ghengis Khan spoiled their fun. Heard of him? Thought you might have done. He was possibly the biggest fun-spoiler in history, and he and his bunch of horse-mad Mongols had a ferocious reputation. He was succeeded by a range of Khans (which means king or ruler, but is often tagged to names to denote respect in the Middle East), including Kubla Khan (he of Xanadu fame), but the empire, like many over-achievers, burnt itself out. After a hundred years of galloping across the Steppes, they suddenly realised that they weren’t too good at governing and had no idea how to keep it all together. The lack of common culture was another factor, although it has to be said that the Mongols left a lasting legacy to the world. Their reach was so extensive that they opened up the world (via the Silk Road) allowing the flow of ideas, thinkers, crafts and commercial goods all the way from China to Europe. In fact the tenth to the fourteenth centuries mark a period of astonishing advances in the Middle East, in all sectors. From our point of view, the most exciting development was the appearance of cookery books. Whilst these were not the first recipe collections in the world (that honour goes to the Roman Apicius), they have been invaluable to food historians and laid the foundations for feasting and fasting in the Middle East for centuries to come. The most famous of these to survive is the Kitabh al Tabikh by a man who came to be known as Al Baghdadi. Baghdad saw a time of great prosperity under the Abbasids, who comprised one of the dynasties of the Caliphate (see above). The penultimate empire on our hit list is the one that has had the most dramatic influence on Western cuisine: the Turkic Ottomans. They came into ascendance in the thirteenth century AD and hung around until 1923 (they were the last Caliphate – see above). The word Ottoman comes from the dynasty’s first leader, Osman 1st, who stepped into the power vacuum left by the Seljuks, and then just for good measure took on the Byzantines. He was succeeded by a range of colourful sultans including Selim the Grim and Suleiman the Magnificent. The Ottomans created a complex society, the upper echelons of which enjoyed great opulence: great importance was attached to food and feasting, and cooking for a living became rather a respectable thing to do. The greatest chefs reputedly came from Bolu in Western Turkey, and were celebrated for their skills. 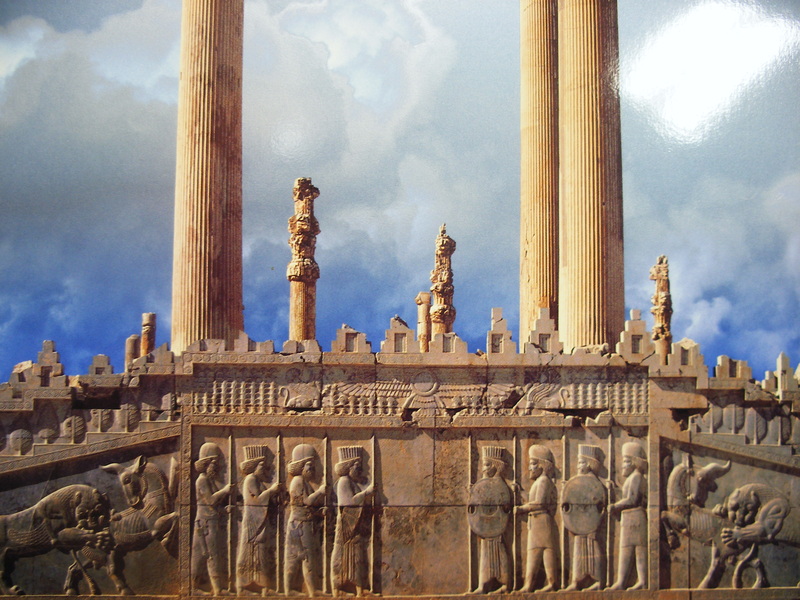 The final empire of note on our excellent adventure was the third Persian Empire, ruled by the Safavids. They were in power for just on two hundred years, starting at the beginning of the sixteenth century, and under celebrity shahs such as the famous Abbas they formulated the modern constitution of Iran. They also created a haven for the culinary and other creative arts, and became as feted as the Ottomans for their extravagance and skill. In the last centuries of the second millennium it was Europe’s turn to rise and shine: travellers to the Middle East brought new ideas and wealth with them and took home much of the culture and cuisine. The time of the great Middle Eastern empires was on the wane. This entry was posted in Postcards from Veggiestan and tagged Achaemenids, Akkadians, Assyrians, Babylon, Caliphate, history, History of the Middle East, Imperial Who's Who, Mesopotamia, Ottomans, Safavids, Sassanids, Seljuks. Bookmark the permalink.